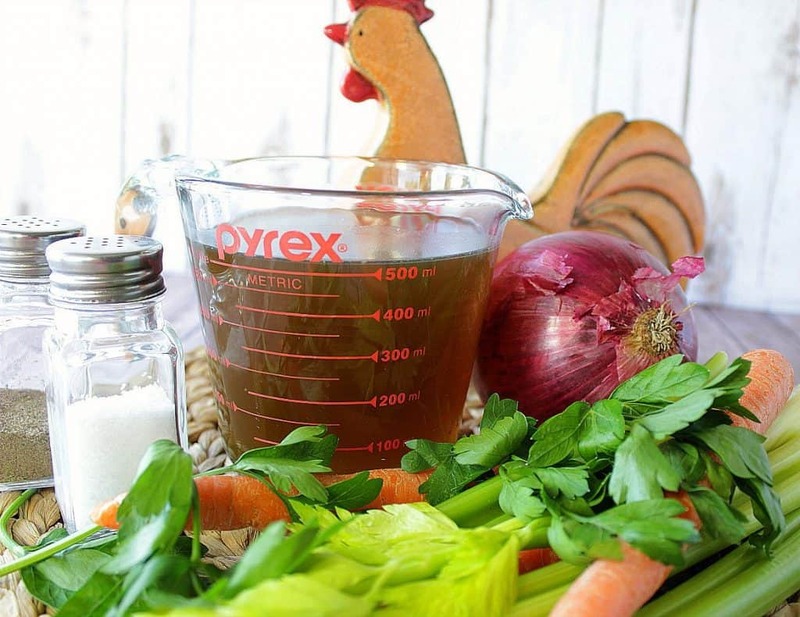 Keep this Delicious Herbed Organic Homemade Chicken Stock your fridge or freezer for all those lovely soups, stews and comfort foods you’ll be making now that fall (and soon to be winter) is officially upon us. When purchasing vegetables and herbs for homemade herbed chicken stock, it’s best (and healthiest) to keep them all organic, if possible. When it comes to choosing organic poultry, you’ll find that you get even more flavor out of a smaller organic chicken than a larger non-organic chicken, which makes buying organic easier on your wallet than you may have thought. 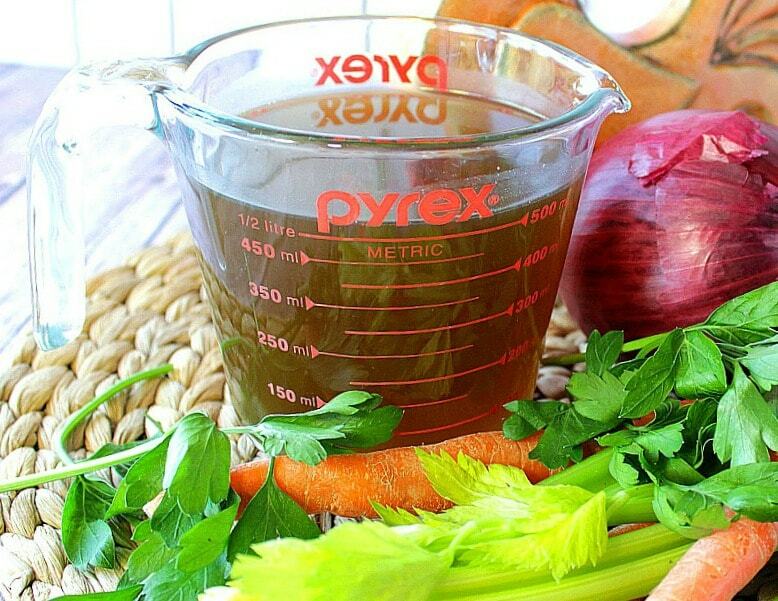 A good tip I have for you when making your own chicken stock is to thoroughly wash the organic vegetables, but also to leave the peels, skins and leaves intact. This way your stock will achieve a deep, rich color, and your stock will also retain all the vitamins and minerals that inherently live in the peels, skins, and leaves. It may seem counterintuitive to do it this way, but I implore you to give it a try. Making Herbed Organic Homemade Chicken Stock takes only moments to prepare. The majority of the work is done by the stovetop as the stock simmers on low for hours and hours, extracting all that wonderful flavor from the chicken carcass, and vegetables. Trust me when I tell you that there is nothing homier or more comforting than the smell of homemade chicken stock wafting through the house on a chilly autumn day! Once made, you can store your Herbed Organic Homemade Chicken Stock in a covered container in the refrigerator for up to 2 weeks. Or you can portion it out into separate smaller containers (ice cube trays are great for smaller batch items) and freeze for up to 3 months. 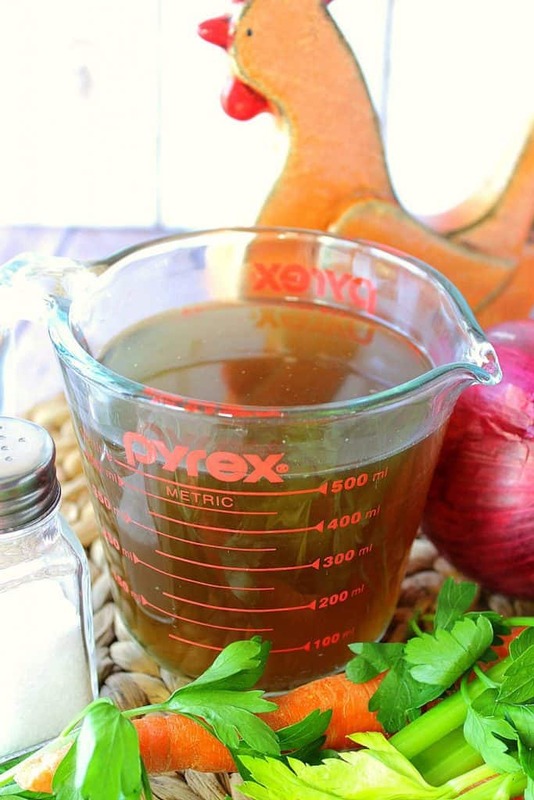 Homemade chicken stock is perfect for making gravy for the holidays and as a base for all manner of soups and stews. Not to mention adding it to mashed potatoes in place of milk, and for flavoring rice and risotto. Basically wherever you’d add water to savory dishes, adding Herbed Organic Homemade Chicken Stock will amp up the flavor like nothing else. 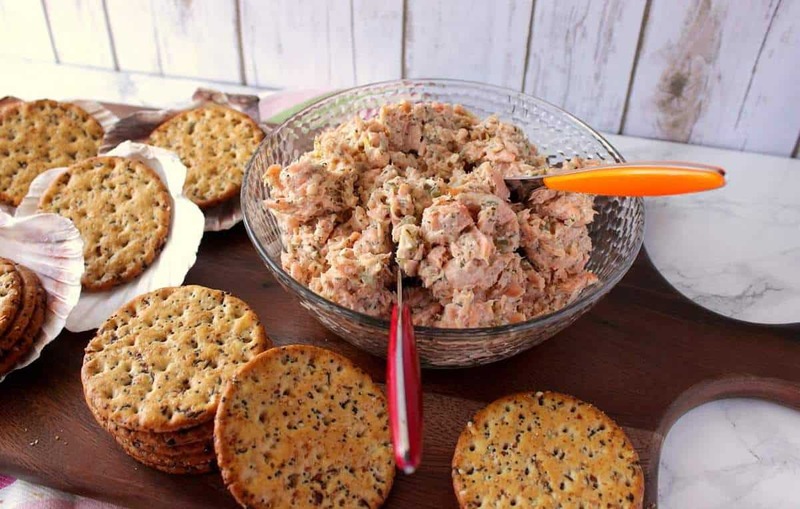 Plus, when you’ve made it yourself, you’re in control of the sodium content, and you have no concerns about shelf stabling preservatives or additives. 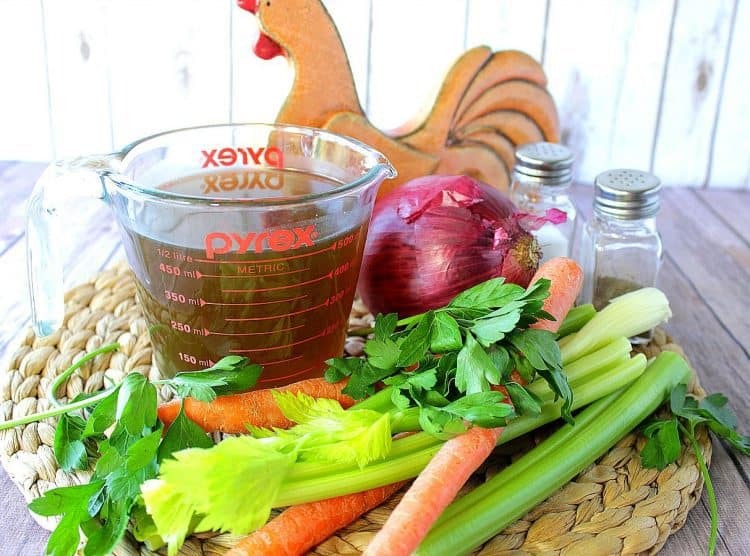 Once you’ve removed all the meat and skin from an organic roast chicken (reserve the meat for another use), place it in a large 6 – 8 quart stock pot (with drainer, optional) along with 4-5 large carrots (washed, with skin on), 4-5 stalks celery (washed, with leaves on), 1 large onion, quartered (outer skin removed, but the majority of skin on), 4 tablespoons salt, 2 tablespoons black peppercorns, 4-5 fresh sage leaves (washed), 1 small bunch fresh parsley (washed). Cover all the ingredients in the pot with enough filtered water to cover. 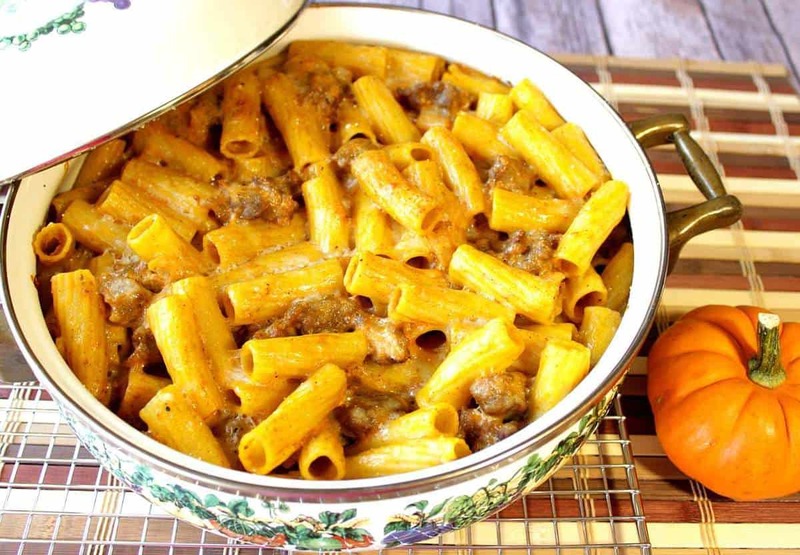 Simmer all the ingredients on low for 4-5 hours. 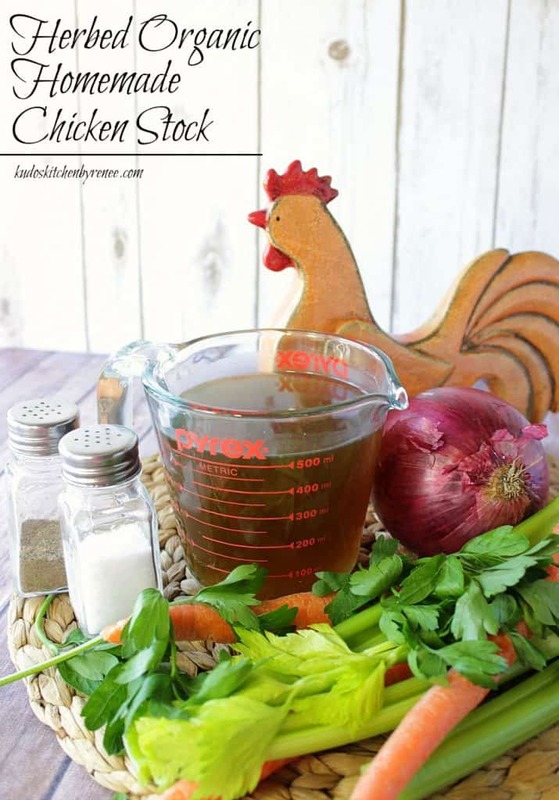 Allow the stock to cool slightly, and then strain the stock into containers for refrigerating, or freezing, and discard the stewed vegetables and the chicken bones. 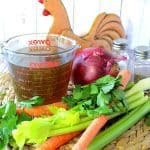 The following Amazon.com items are some suggested products I’ve chosen that will aid you in the making and serving of this Delicious Herbed Organic Homemade Chicken Stock, if needed. By clicking on the photos, you’ll be taken directly to Amazon.com website if you’re interested in purchasing any of these products. You are in no way required to do so, and you will not be charged in any way unless you decide to purchase a product. Keep this Homemade Herbed Chicken Stock your fridge or freezer for all those lovely soups, stews and comfort foods you'll be making now that fall (and soon to be winter) is officially upon us. 1 organic roasted chicken carcass skin and meat removed (reserve meat for another use). Place all of the ingredients into a large stock pot. Add the water to cover the ingredients. Bring to a low simmer over medium/low heat. Allow the stock to simmer on the stovetop for 4-5 hours. Cool the stock and strain into containers for refrigeration or freezing. I’m coordinating this recipe for Delicious Herbed Organic Homemade Chicken Stock with this fun, and whimsical custom hand painted apron that I painted for a customer a few weeks ago. 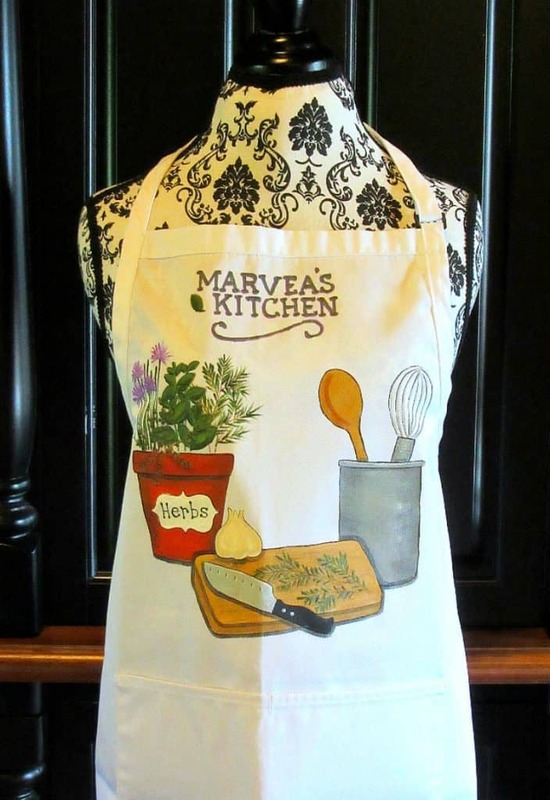 It seems only fitting that an apron that features cooking with herbs be featured in a recipe that does as well. I have yet to add this design to my shop, but should you be interested in ordering one (with a different personalization, of course) I would be more than happy to paint you one too. If there is ever anything I can paint for you, from fabrics (aprons, tea towels, and book bags) to glassware items, please don’t hesitate to contact me via email: info@kudoskitchenbyrenee.com or rgoerger@prodigy.net OR, please visit one of my shops: Etsy and Wazala. I encourage custom orders, and I will happily paint and design from any photo, idea or description you send my way (example shown above). All of my hand painted fabrics are machine washable and dryable, and all of my hand painted glassware items are completely dishwasher safe as well as being non-toxic. Kudos Kitchen Paints, and Kudos Kitchen by Renée ~ Where food, art, and fun collide each and every day!